Western Wildcats men and Dundee Wanderers women were the victors in an action packed Indoor Gala Day 2019 at Bells Sports Centre in Perth. 2nd February 2019 at Bells Sports Centre, Perth. Scottish Hockey Indoor Gala Finals. After a nail-biting finale Western Wildcats won the Men’s Indoor National League 1 final 2-1 in a shoot-out after a 3-3 draw in normal time. Western Wildcats got off to a lightning start when they tore forward at pace and Andrew McConnell slammed home from the left of the D to make it 1-0. It didn’t take Grove Menzieshill long to respond and the goal came via a powerful low finish by Albert Rowling to make it 1-1. The pace of Western Wildcats in attack was troublesome and McConnell was a constant thorn down the left. Grove Menzieshill looked equally powerful in attack and played with a strength and precision that was caused the Wildcats problems. It went to 2-1 to Grove Menzieshill to ferocious applause from the stands when Jamie Golden converted with five minutes of the half remaining. The Wildcats response was swift. McConnell again pounced in the D to slot the ball low against the back board with a crash. 2-2. Harwood prompted great diving save as the half came to a close, Steven McIlavey diving to his right to pad clear. Into the second half and Grove Menzieshill was awarded a penalty flick, but the resulting effort cracked against the left post and the score remained even. As the half continued both sides went toe-to-toe with very little to separate them. Then with six minutes remaining McConnell completed his hat-trick with an exceptional finish into the top corner from a tight angle to make it 3-2 to Western Wildcats. It was the turn of Grove Menzieshill to respond and they did so with a slick attack and finish by Gavin Tomlinson to make it 3-3. McConnell nearly struck again for Western Wildcats with a turning shot at the edge of the D but it went just wide. The teams couldn’t be separated in normal time so the contest went to running penalties. 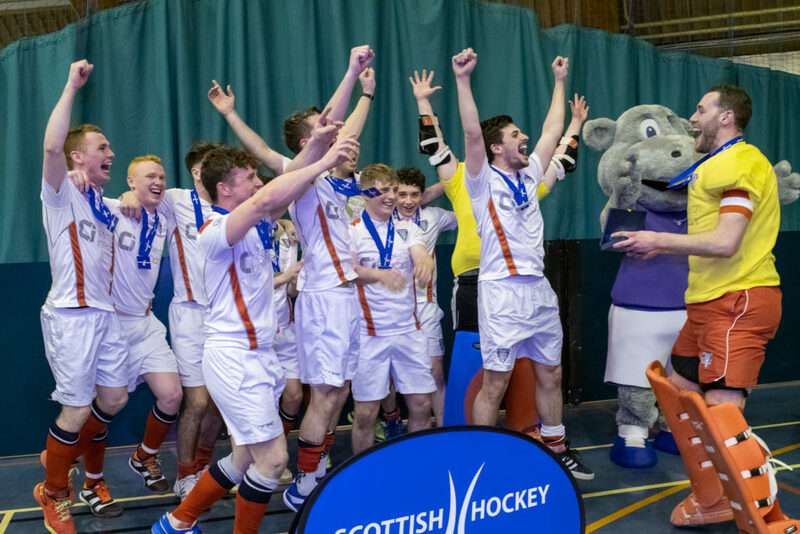 After a nail-biting shoot-out it was Andrew McConnell who scored the winner for Western Wildcats to take the trophy back to Glasgow with a 2-1 shootout victory. 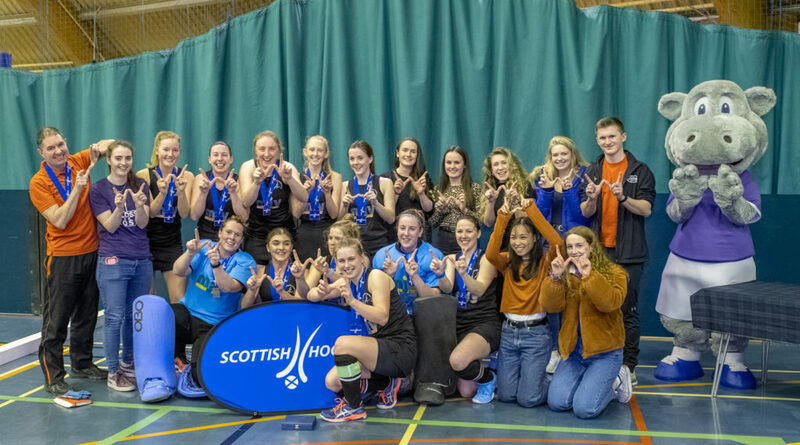 Dundee Wanderers regained the Women’s Indoor National League 1 title with a sensational 7-2 win over Clydesdale Western at the Indoor Gala Day 2019. Wanderers got off to a great start when Ruth Blaikie scored from close range to put the Dundonians 1-0 up. It went to 2-0 when Charlotte Watson pounced in the D to slam home and put Wanderers in a solid position. Clydesdale Western began to get a foothold in the contest after the second goal and pressed the Wanderers D as the half progressed. They couldn’t force the ball over the line. Emily Dark began dominating the play for Wanderers and powered forward to win a penalty flick. Charlotte Watson stepped up to convert the ball low to the left to make it 3-0. From the restart Wanderers came out at pace and a swift exchange saw Vikki Bunce almost pick out Blaikie arriving at the far post. Wanderers scored a fourth early in the second half and the goal came from a quick attack down the left for Heather Elder to slip the ball home at an angle. 4-0. Clydesdale Western went to a kicking back and it had an instant effect. Millie Steiger took the ball in the D and fired against the back board to pull one back for the Glaswegians. 4-1. Wanderers reinstated their lead when Dark sailed a penalty corner into the top right corner for 5-1. Dark was fouled in the D to win another penalty flick for Wanderers, and again Watson stepped up to expertly dispatch and make it 6-1. Another penalty corner routine brought Wanderers’ seventh goal of the contest and it was converted by Ellie Wilson from a Becky Ward injection for 7-1. Clydesdale Western pulled one back with two minutes remaining, a nice exchange into the D was finished off by Steiger for 7-2. It was Wanderers’ day though and they celebrated a great victory in style at the Indoor Gala Day 2019. Watsonians came out on top in the men’s Indoor National League 2 3rd/4th place playoff and set up a contest with Dunfermline Carnegie to try and secure promotion. It was a bright start to the contest with both sides out to attack. The opening goal went the way of Watsonians and it came through and excellent penalty corner strike by Ben Allen in just the fourth minute. Hillhead enjoyed most of the possession in the opening half and moved the ball well around the Watsonians half. Watsonians looked very dangerous on the break however and it proved telling when Fraser McCurdy scored after a swift break from the right. McCurdy calmly and collectively slammed the ball low under the goalkeeper for 2-0. Hillhead pulled one back towards the end of the half. They were awarded a penalty flick, and Fraser Ward slammed it low into the bottom left corner to make it 2-1. 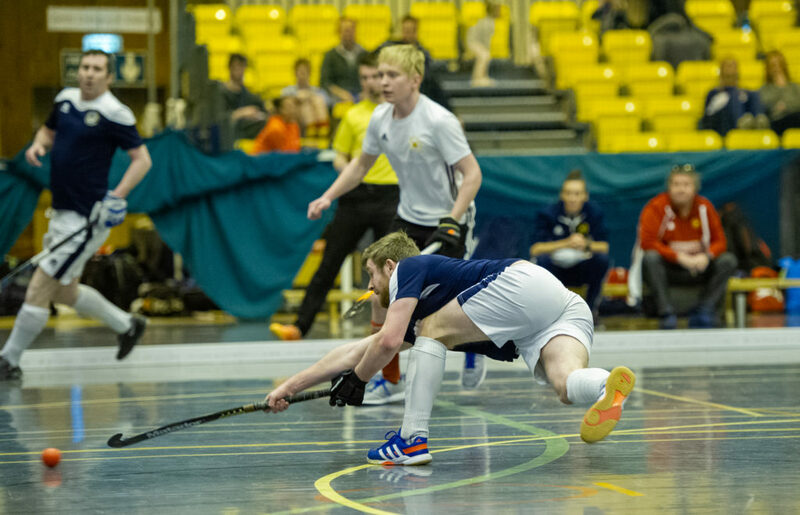 Into the second half and Hillhead’s Grant McMillan showed tremendous skill to work his way into the shooting circle and round the goalkeeper, but he couldn’t direct his shot on target and Watsonians held onto their lead. Watsonians advanced their lead with seven minutes remaining when Fraser Heigh struck to make it 3-1. Hillhead then struck back through an excellent team goal that saw them pass through the Watsonians defence for Andrew Black to finish off at the far post. 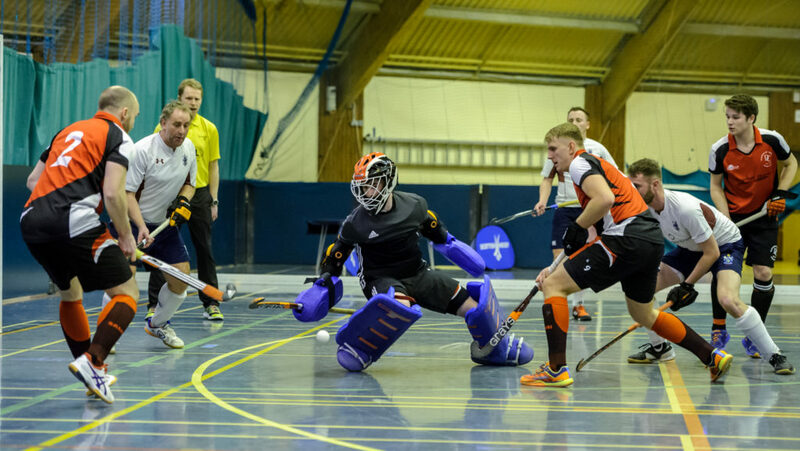 Hillhead took off their goalkeeper Jamie Frail for one final push but got caught out when Heigh struck again for Watsonians to seal a 4-2 victory, and secure a match against Dunfermline Carnegie for a chance of promotion. 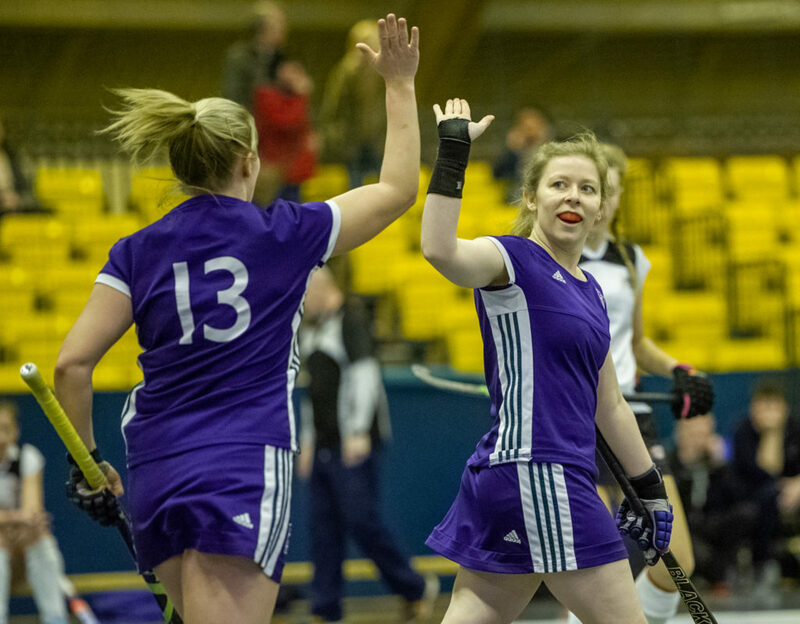 The Women’s Indoor National League 2 final was won by Inverleith in an amazing seven-goal thriller at Bells Sports Centre. Inverleith got off to a great start and were on the front foot from the outset. The early pressure was rewarded with a goal and Carly Bissett scored a delightful penalty corner into the left corner to make it 1-0. Bissett almost bagged a second moments later with a carbon copy penalty corner attempt of the same routine, but it was well blocked on the line to keep the score at 1-0. It went to 2-0 after some consistent Inverleith pressure fashioned a chance for Sarah McKay to slot home low against the backboard. Granite City Wanderers worked hard and forced their way back into the contest. The pulled one back when a great break and low finish past the advancing goalkeeper to pull it back to 2-1. Katie Swanson restored Inverleith’s two-goal advantage when she scored from close range to make it 3-1 before a Granite City Wanderers penalty corner routine saw the injector pop up at the far post to score and make it 3-2 at half time. Inverleith’s penalty corner ability proved telling in the second half. First, Bissett launched the ball low against the backboard to make it 4-2 before bagging her hat trick moments later to make it 5-2. Grove Menzieshill 2s won the Men’s Indoor National League 2 final in incredible seven-goal thriller against Uddingston. The game got off to a flyer and it was Uddingston who took the early lead. Steven Percy played the ball to Chris Boyle in the D and Boyle finished low to make it 1-0 to Uddingston. The early goal prompted a quick response from Grove Menzieshill 2s and it was Luke Cranney who struck to level the scores. Grove Menzieshill 2s then took the lead through a penalty corner routine finished off by Andrew Suttie at the injectors post. It went to 3-1 when some clinical finishing by Christopher Wilson put Grove Menzieshill 2s firmly in the driver’s seat. The second half saw Uddingston on the front foot but the Grove Menzieshill 2s defence was holding firm. Connor Evans pulled one back for Uddingston with six minutes remaining. A powerful low shot left the goalkeeper with no chance as Uddingston pulled it back to 3-2. A tremendous spin and shot by John Stephen restored Grove Menzieshill 2s two-goal advantage with three minutes remaining. A lovely penalty corner finish by Steven Percy saw him pick his spot in the roof of the net to make it 4-3. It was victory for Grange in the Women’s Indoor National League 1 promotion/relegation battle at Bells. Grange controlled possession in the early stages but Granite City Wanderers looked dangerous on the counter attack. Grange’s Kirsten Turnbull scored the game’s opener when she managed to squeeze the ball low past the goalkeeper and into the goal. 1-0. Granite City Wanderers went on the attack and fashioned a variety of opportunities. They came close to scoring when Jenn Tait had a low penalty corner cleared off the line. Tait wouldn’t be denied for long and struck just before half time to finish off a lovely team move and make it 1-1. After the restart a penalty flick was awarded to Granite City Wanderers but Eilidh Seedhouse slid her low shot past the right post. Granite City Wanderers went to kicking back for the final seven minutes and it was perhaps to their hindrance when Grange was awarded a penalty corner. The resulting effort by Beth Dodds sailed into the top right corner to make it 2-1 to Grange. Then a swift Grange counter-attack moments later saw them go 3-1 up through Laura Protheroe, before another quick break let Tara Allister make it 4-1. A goal-fest from Dunfermline Carnegie saw them retain their Men’s Indoor National League 1 status. It was an excellent start for Dunfermline Carnegie; Martin Daw slammed the ball low against the back board. 1-0. In response Watsonians fashioned an excellent opportunity for an equaliser with a swift move down the right, but Magnus Ferrier’s final effort went just wide of the target. It was Carnegie who struck next and the goal came through some top finishing by Andrew Doyle to make it 2-0. Right before half time Carnegie went 3-0 up from a nicely work penalty corner routine, Rhys Connah providing the finish for a comfortable lead. At the start of the second half a penalty flick went the way of Carnegie and it was neatly dispatched into the roof of the net by Robbie Wallace. Watsonians came back fighting and pulled one back with a nice move finished off at the post by Fraser Heigh. Heigh was at it again moments later when he struck to pull it back to 4-2. Paul Weston scored for Carnegie through a penalty corner; he slotted home with power to pull it back to 5-2. Watsonians continued to battle and they scored a third through a powerful low shot by Harry Connolly. Carnegie struck again on a quick break when Michael Ross hammered home to make it 6-3 before sealing the victory through Gary Clark with a seventh strike for 7-3. It went to 8-3 in the final seconds to complete an excellent victory for Carnegie at Bells Sports Centre in Perth.